Reveal your Christmas surprise from Bath & Body Works. 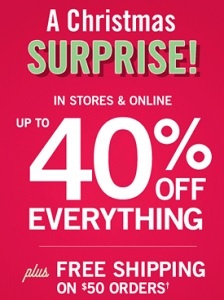 Visit your nearest Bath & Body Works store or official website and enjoy savings up to 40% off original retail prices. Plus, enjoy a free shipping on orders of $50 or more, valid online only. To receive the offer at stores print a special email. Source of the information is Bath & Body Works. Offer expires 11/20/2015. More details at stores or online.